Fair Use in toy photography is a concept that doesn’t ever go away. In fact it is more relevant now than ever before. With more and more toy photographers selling their work both on and off line, it would be nice to find out where the big boys fall when it comes to Fair Use. If you’re not familiar with the previous conversation, let me bring you up to speed. The following is an excerpt from a blog post originally published May, 2016. At the end of the post is the million dollar question. When you photograph someone else’s intellectual property, and by this I’m referring to licensed toys, the issue of fair use is not an abstract concept. As Paul pointed out in an earlier post, we toy photographers work within an admittedly grey area. It’s hard to know where the line is drawn between the artist and Big Inc. when it comes to the idea of ‘fair use’. If you’re one of the many toy photographers who would like to be able to pursue some monetary gain from your amazing photos, this issue will eventually become problematic for you. I think most of us are pretty realistic that selling toy photography is not some get rich quick scheme, so the idea that we have to fight over a few dollars, pounds, or euros with Big Inc. is discouraging. But even knowing that this is the case, the idea of making a little extra money on the side to help offset the inevitable toy purchases we’re always making is appealing. I’ve seen many toy photographers list their work on Redbubble, Deviant Art and Society6 as an easy way to make their images available for sale. While this is admittedly a convenient way to sell your work because all you do is upload your photos, set your prices and sit back and watch the money flow in (OK maybe it’s only a trickle), it also makes you an easy target for the intellectual property lawyers and the bots who work for them. I only have to look to my friend Paul (aka Bricksailboat) and his multiple take down notices, to see how there is no rhyme or reason to whose images are removed from these third party marketplaces and whose aren’t. Normally I would say, “Gee you asked for it. You’re knowingly playing with someone else’s intellectual property. Of course you’re putting yourself in the cross hairs of the corporate law team.” But what happens when the majority of your favorite toy line (I’m looking at you LEGO) is made up of sets based on the intellectual property from other corporations (i.e. Star Wars, Disney Princess, TMNT, Back to the Future, DC Super Heroes, Scooby Doo, The Simpsons, Ferrari, etc…) or they’ve licensed their own original property to another corporate entity; for example, Ninjago licensed to Warner Brothers. It doesn’t seem like there is much left that doesn’t come under some lawyer’s watchful eye. Who can fight a ‘take down’ letter from a corporate entity delivered by another corporate entity? The layer of lawyers, who are ‘simply doing their job,’ is so thick it’s impenetrable, overwhelming and far too costly to fight for the independent artist. In fact, I’m pretty sure that’s what they’re counting on. As in independent artist, I’m nearly powerless because I’m working alone. And what’s worse, I’m not even a part of the conversation for artistic rights. But life gets even more twisted for toy photographers when the toy companies reach out to us and use us to sell their products. If you’ve been paying attention, I’m sure you’ve seen Hasbro utilize a few prominent toy photographers to promote their toys. ThreeA is another toy company that has often used great toy photography created by independent artists in their social media campaigns. Maybe these artists are well compensated, but my instincts tell me they probably aren’t; flattery and a few free toys will get a corporate marketing team father than you can imagine. I certainly don’t begrudge any artist the opportunities afforded them working with a large corporation, we certainly jumped at the chance when it was offered to us to align ourselves with The LEGO Group. What I object to is that Big Inc holds all the cards in the current paradigm. How is each individual artist going to be able to afford a lawyer to tell Big Inc. that they can stuff it when the next take down notice arrives in your e-mail in-box? Much of the Fair Play and ownership rights issue revolves around whether the artistic work is Transformative. I do believe that in many cases that as artist we do take those little bits of plastic made in China and create transformative work; and by doing so we own it. I’m pretty sure LEGO never intended their mini figures to be liberated from their plastic universe like they are in my world. Or that Ninjas would take over a sailboat and then travel by camel across the United States like they did in the world created by Bricksailboat. Are Storm Troopers wearing Barbie style clothes and kayaking in Scotland what George Lucas envisioned when he created them in 1977? If we have to create work that is artistically transformative to own it, where is that line? How much transformation is enough? Of course if you’re recreating each Star Wars movie frame by frame using LEGO, I think we can all agree that would not be considered transformative. Even Boba can’t outrun the corporate intellectual property lawyers. Up to now I’ve made a conscious decision to only sell my work independently. I may be missing out on some amazing pay out by not going the mass produced route, but this way I control the conversation and more importantly I control the money. 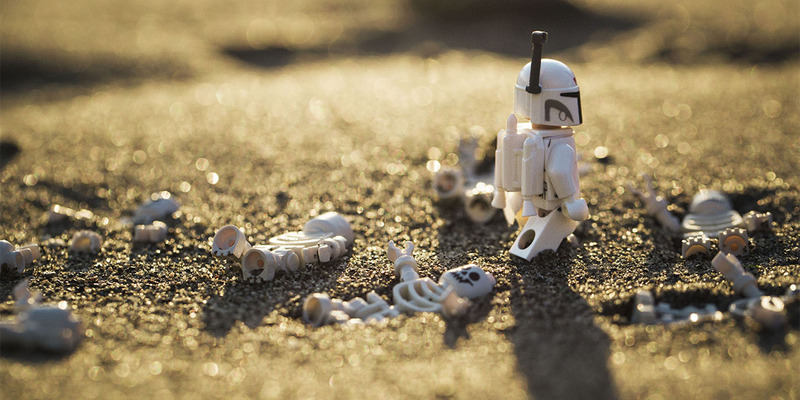 I’m not the only toy photographer pursuing this route. And as toy photography becomes more mainstream, it will be harder for the large toy companies and intellectual property owners to turn a blind eye. I have no idea how to force this conversation and ultimately its clarification. Since our relationship with our own corporate overlord is a delicate balance, by pushing this issue I certainly run the risk of a prematurely ending of our partnership. But if we do push a few buttons, at least we would have an answer to the million dollar question of what constitutes fair use in the world of toy photography. Personally, I think we need to be asking these questions as loud as we can, because I’m afraid that if we don’t stand up for ourselves Big Inc is going to own everything, including us. If you could ask a lawyer at The LEGO Group about Fair Use or how they feel about toy photographers, what would you ask? Next PostWhat is Toy Photography? Thanks Gary! I wrote this a couple of years ago and so much is still true – at least from the artists perspective. Im wondering if the LEGO companies view point has changed? There is only oneway to find out! I know this isn’t the first time you’ve written about this so I’m aware of your stance, one that I happen to agree with. This is the first time you’ve done it as a TLG partner (or recognized media or whatever) and so I’m wondering about the consequences but… brava! BRAVA! I’d love for TLG to address this for us artists (photographers, sculptors, graphic designers, brickfilmers, etc) but that’s probably a long shot. Personally, my goal isn’t to make money from my photography, but I am a patron of independent artists and have bought and will continue to buy LEGO inspired artwork that isn’t official TLG. On TLG and the IPs of other companies (Disney, Marvel, DC, Harry Potter, etc), I’m so sick of it all. The over-commercialization just makes me dizzy and ornery. The day I saw BB-8 branded clementines in the supermarket was the day I banned anything Star Wars from my household, so this constant deluge of Star Wars in LEGO has cost them some of my affection and loyalty. Not all, but a lot. Anna, Thanks for your comment and support. Honestly I never gave it a second thought about being a RLFM and our connection to LEGO when I wrote this. Maybe its because of that connection I have the name and email of a LEGO lawyer and I can actually ask some of these questions to! I realize Im poking a stick at the bear, but why not? You only live once and I would like to breath a little easier as an artist. 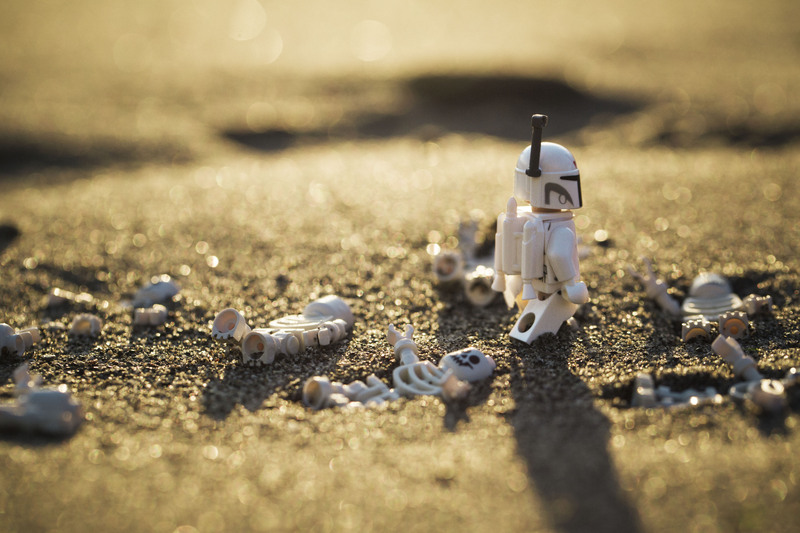 I completely agree with you about the licensing problem at LEGO. They license other peoples IP and they license their own to other entities – all in the name of making a buck. But it makes it very hard to create original stories and have true imaginative play. As kids and adults we are always bumping up against, reacting to or incorporating someone else’s story in our play and in our art. Thank you Shelly for this write up. It brings up many good points. I like the idea of transformative work but at the same time I see a Star Wars figure and it hasn’t been “transformed” at all. The context in where it resides has been altered (character, placement, backstory, etc.) but the actual toy looks pretty much the same. This is where I am confused. I think the backstory and placement is where the largest part of artistry resides in toy photography. The quality of how to get the story across and the creative work to produce an end photo I’m proud of is rather time consuming and requires a lot of effort. That is why I am totally against Big Inc. sueing fans or trying to block their narratives with take down notices and such. Now, if a toy company were creating art with their IPs and selling that art then I could see a reason to pursue legal action – but generally all toy photography art does is sell more toys for Big Inc. If anything we are basically creating an endless supply of marketing content for Big Inc at no charge. I don’t know he answers and sometimes I don’t even feel I know what questions to ask – but sitting down with a LEGO Group lawyer to learn would be quite the experience. I would like to pick their brain about why some content is frowned upon while others are not. Do they look at he influence and reach of a photographer? Do they know the amount of work that goes into creating this art? It really is not as easy as setting a toy out and taking a picture… there is brainstorming involved, there is a story to be told, there is a method to the madness – and it generally is not money. Joe I hope you dont think the images I chose are representative of “transformative” images. I chose Boba Fett because he is one of the few figures I photograph that is a licensed IP. The first image is pretty clear, he represents Big Inc and is walking on the broken dreams of artists. The second in image he is Big Inc being chased by a t-rex – which can be a stand in for corporate stock prices and greed. 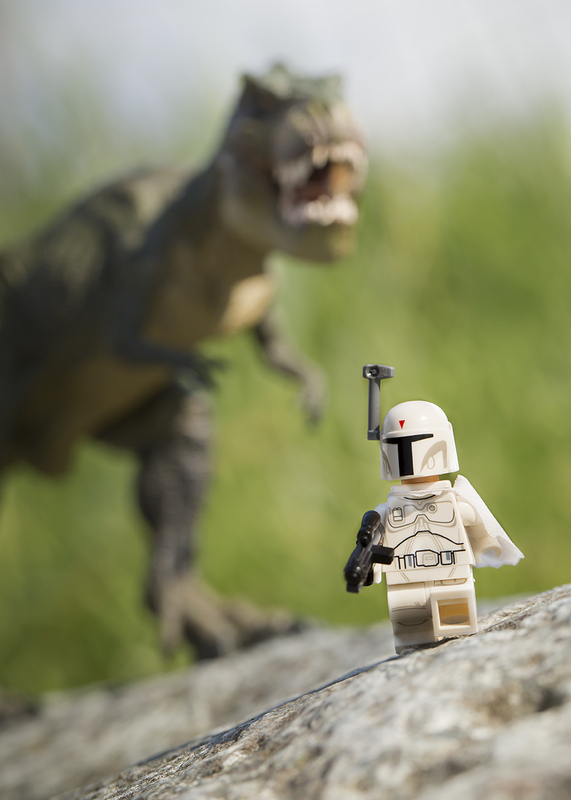 Or maybe Boba is the simple mini figure being chased by Big Inc the ferocious T-Rex. They are both allegories and are not images I would sell. Thanks for the write-up Shelly. You know i’m interested in this topic and could talk for hours…. but i don’t have the time rigjt now. A quick question instead; why is this a problem in the first place? If i make a picture with an ikea closet as topic and sell it, can ikea come after me? If i makena picture of an old Gazelle bike and sell it, will Gazelle come after me? If i make a picture of a Mercedes car and sell it, will Mercedes come after me? Why is it that selling pictures of Lego and selling it is such a problem to Lego? If i make a picture of a little kid playing with a Lego set, focussing on the set and the kid out of the depth of field…. and sell it… will Lego come after me then too? The only question i would have is: WHY? I simply don’t get it; i really don’t! If every company would come after a photographer that used their product…. well… you catch my drift. The answer to your quick questions is yes… all of these could come after you if they so choose to. If the main subject of your image is something the company has designed, then in legal theory, THEY own that design and YOU are attempting to profit from that design. We have seen that case play out in Sydney with the Harbour Foreshore Authority (at least I think it’s them). They claim ownership of the likeness of the Sydney Harbour Bridge and the Sydney Opera House. You are legally not allowed to take photos where these elements are the main focus, in whole or in part, and sell them for profit. You’re allowed to for personal, tourist reasons, but not to sell. It is all ridiculous, and many wouldn’t pursue you, but the fact remains the would have the right to do so. All great questions and I feel and mirror your frustration. I guess I can only ask is any of the potential images you mention are transformative. Even though the product is the subject, is the over all meaning more than the original product? Are you sell ing the closet / bike/ car or the symbolism of the image? And honestly it all comes down to money. If any of these companies felt you were making money off of your image they would surely come after you to either stop you or have you sign a licensing agreement where you would forward on some of your profits. Big Inc wants their share…that is why they are so awful. I feel they are stifling the creativity of artists everywhere in their quest to ‘defend’ their brands and make a buck. I actually didn’t even notice it was Boba Fett in your shots. 😂 I guess it comes down to the definition of transformative – as Boba Fett in both these scenes never screamed Star Wars to me so I hadn’t labeled it as a Star Wars IP shot. I guess this is the cloudy area for me. The Boba Fett in your images don’t follow the same path of Fett in the movie and therefore is transformative. What I’m getting at is how much of the IP is wrapped up in looks vs storyline? It can seem ridiculous across the board. But sometimes a simple legality is behind the prosecution. Many of these companies have to be seen to be protecting their trademarks to maintain them. Failure to do so could see a competitor or antagonist attempt to invalidate a trademark based on the idea that it has gotten out of control of the company that has the trademark. I imagine this is the main reason they go on a bender occasionally and sick the hounds on the market. That’s the reason Lego will absolutely come after anyone who uses the term Lego in a domain name, a product name and sometimes even product descriptions. I imagine that’s why Bricklink, which only sells Lego bricks, not mega-blocks, or play mobile or any other product, doesn’t have Lego in their URL. Most folks who have tried this have received a letter from Lego’s lawyers. Your article is great, it does display the hypocrisy of these companies who will approach those who are getting a name in social media to create buzz for them, and it’s true they don’t hold all of the IP rights for their own products, which is crazy. Some is licensed in, and some is licensed out to third parties. So whose lawyers end up coming after you is anyone’s guess. But if you’re in the States at least, you should have little trouble fighting the fair use argument, especially on a transformative basis. Just look at the BS case of Richard Price, the artist who was taking people’s Instagram posts, and Instagrams IP by copying their design work, adding a comment of his own at the bottom, as if it appeared on instagram in the first place, and then calling it transformative. He has been sued in the past, settled some, but mostly appeals and wins on appeal that he is not in breach of copyright. He’s selling what is essentially a blown up screenshot of someone else’s photo, with an instagram frame, for $90,000 and people bought them. It’s often just a case of their deep pockets against our very shallow ones, and I’d be surprised if a Lego Group lawyer didn’t tell you it was about ensuring they can maintain their Trademarks rather than a dissatisfaction with what you’re creating. Of course sometimes it’s that though. Brands don’t love it when their products are shown in a manner contrary to their story. i.e. Mattel doesn’t want to see Barbie dressed as a prostitute and may well send the legal hounds after someone who does so. So yeah, I guess they are my two main points… companies, particularly big ones, need to show they are protecting their Trademarks or risk losing them and they like to protect the story of their work, something they sometimes have trouble with when items, like minifigs, can be so easily anthropomorphised and put in sketchy situations. But keep up the good work, maintain the relationships with the big companies, keep taking the money and toys from Lego while they’ll give them to you, because we love what you all do with them! Oh my so much to process in this, let me take it paragraph by paragraph. LEGO has done a lot in the past two years cracking down on anyone using LEGO in their name. All the LUGS had to remove LEGO from their identity. So if your local LUG changed its name recently, thats why. As you say, this is one of the ways companies protect their brands. I wonder if this change in emphasis has been why I dont hear about as many take down notices on third party sales sights? Or maybe we all learned our lesson? Lets be clear that BrickLink sells their own banded LEGO computable bricks. If they are not on the site now, they will be soon. I have this from a very good source who has worked closely with that company in the past. Im not sure if LEGO is aware of this fact though. LEGO sells their IP’s when they can to maximize profit. That is why some take down notices come from Warner Brothers and others from LEGO directly. A friend got a take down notice from WB for a LEGO pirate photo supposedly because their was a pirate movie in the works. Seriously they went to far on that one. Their hypocrisy drives me nuts! Thank you fro reminding me of Richard Prince. He is the poster boy for anything goes. While I thought his actions were despicable, he does make a point. And if his last ‘transformative’ process is good enough for a judge, then what most of us create with our toys is more than far enough away from most of these IP’s to not warrant the legal action. But really we are so small, and Big Inc so big. Until we band together and say enough is enough, we will continue to be pushed around. It’s a really complicated thing. Like You said Shelly, toy photographers are basically endorsers of particular big corp, but without the advantages of endorsement ( or at least most of us). I don’t have knowledge about selling toy photos and IP but it seems strange that Lego would make problems if somebody is selling pictures containing Lego products especially if it’s an artistic transformation. I’ll try to ask my fellow lawyer, specialist in IP. But of course regulations might be different in different countries. Thank You for this great detailed post! Tomasz If you can get information from an IP lawyer in Poland that would be great! I have one in NY I plan on reaching out to, but having a European perspective would be wonderful! I understand each country is different, and what works for the US doesn’t always fly in other countries. Cheers my friend! I don’t think I’ll ever be in a position where I am selling my pictures, but I think alot of this applies to websites as well. I know alot of people who have run Star Wars web sites or used SW images and got jumped on by Disney big time. Wonder how we fair if we create our own character from a TV show/series from Lego, but is not part of a regular Lego series/property? I’m assuming this then comes under the glare of the original property owners? JP you are too kind! Ive heard awful things bout the Disney lawyers. But I’m pretty sure if you wave some money at them they will license the Star Wars name to pretty much anything. I think that if you create a character from bits of LEGO but it resembles someone else’s IP you definitely run the risk of a run in with a lawyer. But you can look at all the third party brick creators to see that there is plenty of leeway there. I’ve found that it all comes down to money…are you making enough for the lawyers to come after you? I will let you know what I find out! It’s a wonderful chance to put the communities questions to a lawyer at LEGO. My question would be, without you acting as a mediator, where do we go with our questions relating to Fair Use? I remember chasing answers around this when Chistoffer and I put on our exhibition, and found it incredibly difficult to get answers. It would be wonderful if there was an avenue to access answers easily! I look forward to the follow up post to this one! Great question Brett – I will add this to my list – Were do we go if we have a specific question? Thanks for your support and I hope I can provide some answers soon! Thank you for writing this post and looking into this, Shelly. As you know this is something I’ve had trouble with myself, so I anxiously await your follow-up and to hear what answers you may get from the lawyer. I think that the more we can keep issues like this in the forefront, the more transparent the “rules” will be. It’s frustrating when it’s such a grey area, and usually you don’t figure out an answer until it’s too late and your work is being taken down somewhere.